I’ve been looking for a potential yen play for the upcoming BOJ statement and I’m liking this one on CAD/JPY. I haven’t decided on a particular direction yet, though. 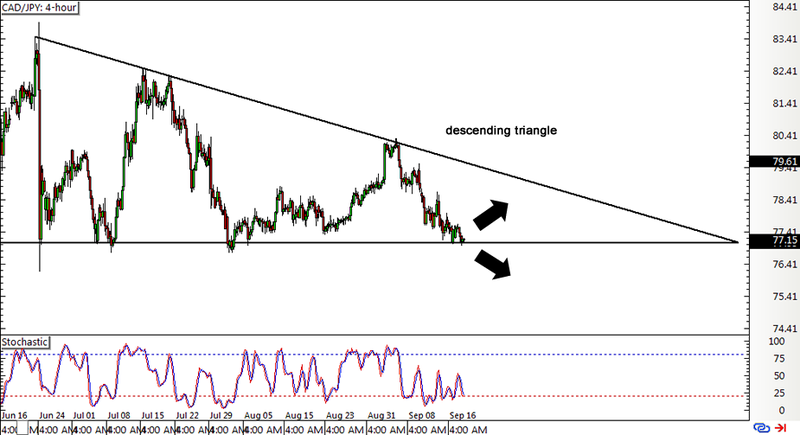 On the pair’s 4-hour time frame, a descending triangle pattern can be seen as price made lower highs and found support around the 77.00 major psychological mark. The pair is currently testing this support area, still deciding whether to go for a bounce or a break. As Forex Gump mentioned in his central bank events preview, the BOJ might dole out another batch of easing measures such as rate cuts or additional bond purchases. If so, the yen could lose a lot of ground against its peers, but the lack of action or a disappointing amount of stimulus could still spark a yen rally. I haven’t set any actual entry orders yet since I plan on waiting for the dust to settle after the announcement before hopping in. Still, I’ll be ready to hop in a small position if price makes a strong multi-hundred-pip one-way move. As for the Loonie, expectations for the OPEC meeting in Algiers could also mean strong moves for the oil-related currency. So far, a number of energy ministers have been buzzing about the possibility of an output freeze but they haven’t really made anything official yet. If I’m able to catch some pips off this one, I plan on closing ahead of the FOMC statement in today’s U.S. session, knowing that risk sentiment could flip right around that time. For now, I’m looking at a possible short below the 76.00 handle or a long past 78.00, probably aiming for around 500 pips, which is the same height as the chart pattern.